Southampton scientists aboard the Royal Research Ship James Cook have discovered a new set of deep-sea volcanic vents in the chilly waters of the Southern Ocean. Using an underwater camera system, the researchers saw slender mineral spires three metres tall, with shimmering hot water gushing from their peaks, and gossamer-like white mats of bacteria coating their sides. 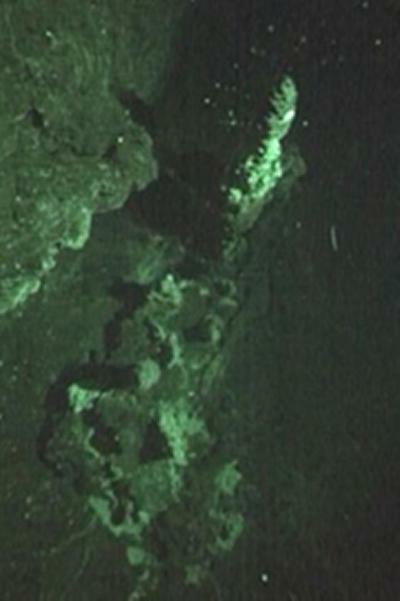 The vents are at a depth of 520 metres in a newly-discovered seafloor crater close to the South Sandwich Islands. Deep-sea vents are hot springs on the seafloor, where mineral-rich water nourishes lush colonies of microbes and deep-sea animals. In the three decades since scientists first encountered vents in the Pacific, around 250 have been discovered worldwide. Most have been found on a chain of undersea volcanoes called the mid-ocean ridge, however, and very few are known in the Antarctic. "We're finding deep-sea vents more rapidly than ever before," says expedition leader Professor Paul Tyler of the University of Southampton. "And we're finding some in places other than at mid-ocean ridges, where most have been seen before." By studying the new vents, the team hopes to understand more about the distribution and evolution of life in the deep ocean, the role that deep-sea vents play in controlling the chemistry of the oceans, and the diversity of microbes that thrive in different conditions beneath the waves. The researchers were exploring 'Adventure Caldera', a crater-like hole in the seafloor three kilometres across and 750 metres deep at its deepest point. Despite its size, Adventure Caldera was only discovered last year by geophysicists from the British Antarctic Survey. The new vents are the fourth set to be discovered around Antarctica in three expeditions since 2009. Their discovery is part of a project funded by the UK Natural Environment Research Council, which involves researchers from the National Oceanography Centre in Southampton, the British Antarctic Survey in Cambridge, the Universities of Southampton, Newcastle, Oxford, Bristol and Leeds, and Woods Hole Oceanographic Institution in the US.